These three sepia colored photographs show U.S. Senator Charles Curtis campaigning for the vice-presidency of the United States. Curtis and presidential running mate Herbert Clark Hoover, were elected in 1928 by defeating Democratic candidate Al Smith and running mate Joseph Taylor Robinson. 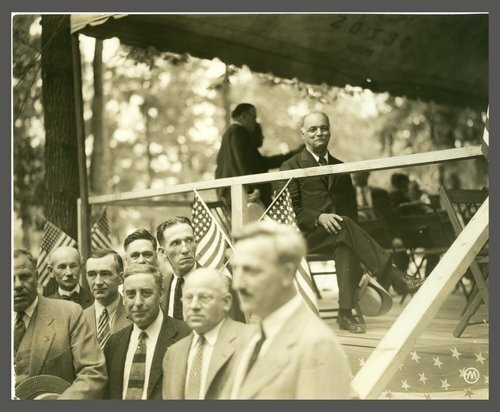 The Hoover-Curtis ticket sought re-election in 1932, but the overwhelming economic problems facing the country cost them the election to Democratic candidate Franklin D. Roosevelt and his running mate John Nance Garner.